Teucrium chamaedrys has long been known in traditional medicine. This Mediterranean plants is quite widespread and thrives on various terrains. Tea from teucrium chamaedrys is highly prized and mostly is used for stomach with digestive problems and digestion. There are many benefits of this beverage, as well as other preparations with plants. Read on to learn more about how to prepare it and how is it used for treatment. How does this plant look like? It is a permanent half bush plant with branched branches at the bottom, which rise from 10 to 25 cm high. The leaves are densely arranged along the stem, sitting opposite of each other in the vertebrae, a short handle. They are egg-elliptical, dull serrated leaves like oak. Leathery, on the upper side smooth and glossy green. Teucrium chamaedrys has collected flowers in a cluster, the 2-6 pieces in the armpits of the upper leaves. Along with them there are next to flowers leaves, that have the same shape but they are only a lot smaller. All flowers are turned to one. Calyx has five teeth and is usually reddish-purple. The crown is slightly longer than the cup, pink-red, and rarely white. It is characterized by a large lower lip, while the upper part almost does not exist. Teucrium chamaedrys is present in Central and Southern Europe, particularly in the Mediterranean countries. It grows on dry, sunny limestone slopes, the mountain meadows and rocky areas. It can be found in light oak and pine forests up to 2000 meters above sea level. The flower appear from June to August. How to use this plant? The plant has received its name because its leaves resemble the leaves of oak. The only difference is that leaves are much smaller in this plant. French name of this plant is petit chene means little oak. It is sometimes called the chasse - fièvre, which in translation means fever killer, because for this purpose it is used in folk medicine. What is the composition of the plant? Teucrium chamaedrys contains large quantities of tannin ( 12 percent), essential oils, flavonoids, iridoid monoterpenes, diterpenes. It has alkaloids as well. All of these substances contribute to its bitter taste, which is very healing and appreciated in phytotherapy. How to harvest this plant? Harvest exclusively aboveground part of teucrium chamaedrys in flowering time. Cut it with scissors, remove the dry and damaged leaves. Healthy parts are attached in tufts which are dried suspended on the rope, in a drafty and shady place. For household use the dried plant that needs to be chopped into smaller parts. The most common is teucrium chamaedrys tea for stomach, but is also used for liver problems and kidney problems. In highlands it is one of the most respected natural remedies just in the case of the aforementioned diseases. This plant is used against all diseases of the digestive system, stimulates the stomach, appetite and regulates digestion. Teucrium chamaedrys as medicine prevents pain and inflammation of the stomach and intestines, rehabilitate internal bleeding. It has a mild constipation effect so it is used in dysentery and acute diarrhea in children. It is also used as a slightly antiseptic agent with infectious diseases accompanied by fever. Teucrium chamaedrys tea is especially good for both acute and chronic bronchitis. Improves liver and relieves the symptoms of biliary disorders. This plant has long been known as a formidable fighter against rheumatoid arthritis and gout. It helps remove water from the body and better sweating. It is also used as a coating for skin rashes. It helps to flush hemorrhoids as well as in poorly treated wounds. It proved great with vaginal infections and white washing. For them particularly effective is tea for outdoor use. Did you know: There is a story of how Czech King Charles the Fifth cured gout using this plant. Also people do not know that teucrium chamaedrys has been used with other herbs, used for making fine liqueur chartreuse and vermouth. In addition it is used with other known alcoholic beverages, due to its fine flavor. How to make tea from teucrium chamaedrys? Teucrium chamaedrys tea proved to be excellent in the treatment of the diseased liver, kidney and bile. Bitter taste is perfect for stimulating appetite. It is rich in vitamin C and has a major role in strengthening the body and strengthening the immune system. Except for internal use, it can be used outside for washing and festering wounds, inflamed hemorrhoids and ulcers. It is not advisable to sensitive people. Required is prior consultation with the doctor before consumption. 2 tablespoons of finely chopped herbs pour with 5 dl of boiling water, cover and let it stand for 30 minutes. After that strain well the obtained teucrium chamaedrys tea. Dosed is 1 to 2 cups after meals. Thus prepared beverage except for drinking, can be used for cladding and medicinal baths. 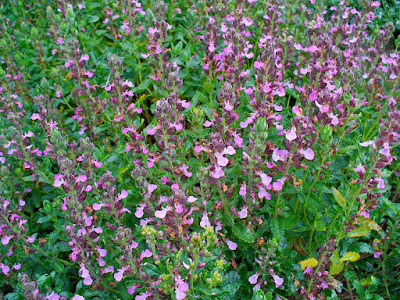 Tea from teucrium chamaedrys should not be sweetened, it is necessary to drink it bitter, three times a day. 2 large flat tablespoons of herb drizzle with half a liter of water. After it stands for 30 minutes, strain and use to wash the affected part. You will notice how quickly the infection withdraws. With a liter of quality domestic red wine pour 200 grams of coarsely chopped herbs. Leave it to stand for 8 days in the mild room temperature. When this period passes store this healing potion store in a cool place, preferably in the refrigerator. Wine is dosed in the amount of 2 dl during the day for more than 30 days, then take a break. Weak and anemic persons, should use it for rinsing the wounds. 20 grams of this plant chop into larger parts and add in a liter of hot homemade brandy. Leave it to stand for one whole day. Take 10 to 15 drops a day. The milled powder of the plant is taken in the amount of 5-10 grams daily with warm water. Be sure to use it before meals, helps with digestion disorders and stomach pains. Although it is proven that teucrium chamaedrys is extremely healing, one must be careful with its consumption. 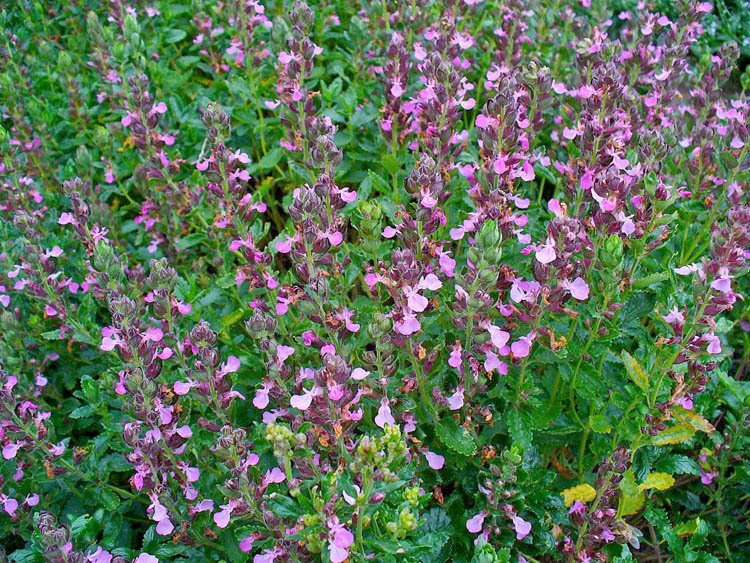 Teucrium chamaedrys was the cause of many liver diseases. There were several cases resulting in death. Therefore, with its consumption you must be careful and must you must consult with a professional. Some west European countries like France, or Canada do not allow its use. USA for example did not ban it completely, but significantly limited its quantity. In USA it is most often used as a flavoring agent for alcoholic beverages in small quantities. We also recommend our earlier article: why should we drink Coltsfoot tea?